Hardcover, 10.25 x 9.25 in. / 128 pgs / 100 duotone. Originally published in 1974 by the Jargon Society and long out of print, The Family Album of Lucybelle Crater is the best-known body of Ralph Eugene Meatyard's work. At once comic and tragic, grotesque and beautiful, the series of 64 images features his wife, Madelyn, in a hag's Halloween mask together in each with a different friend or relative in a transparent mask. Original copies of this small but seminal work now sell for upwards of $500. Critic and scholar James Rhem has worked closely with the archives in the photographer's estate, as well as directly with his surviving family members to reconstruct Meatyard's original, and unrealized, intentions for the publication of this project. As a result, this revised edition features the correct sequencing of images and, most importantly, the missing captions, which, in accordance with Meatyard's instructions, are reproduced in his own handwriting as white type knocked out of a black background. In addition, each surviving participant in the Lucybelle Crater project has been interviewed by Rhem, and the book includes a critical essay and extensive background information. Accompanying the Album are 40 more figurative works establishing a context for it and exploring important themes in Meatyard's work. This is an important rediscovery in the history of American photography. physical & emotive & fantastic. Such knowledge is not expressible in ordinary discourse. emotion cannot be portrayed into the logical form of literal language. is almost useless for conveying knowledge about the precise character of the affective life. 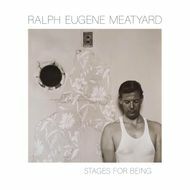 Ralph Eugene Meatyard, reproduced from The Family Album of Lucybelle Crater and Other Figurative Photographs. FORMAT: Hardcover, 10.25 x 9.25 in. / 128 pgs / 100 duotone.